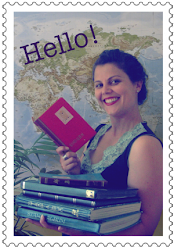 Recently, following my new resolution to adhere to the motto of the Letter Writers Alliance, "plura scriptum epistola", I decided to sign up to participate in the Lovely Package Exchange organised by Danni at her Oh, Hello Friend: You Are Loved blog. The lovely package I sent off. It was slightly more lovely once I added the full postage value with more nice stamps! My swap partner was collage artist and zine connoisseur Kelly who conveniently also lives in Melbourne. It was a very fun thing to do - to put together a lovely package, and then receive one in return. And funnily enough, we must have very similar tastes, because some of the things I included in my package to her, I received in return - namely, some lovely airmail envelopes and some stamps (ah, yes, Kelly must be a girl after my own heart). What do you think? I made it using some vintage National Geographics. And I was pretty pleased with the result. I quite like the three odd-bods at the beach. Inside the package I included a variety of things, which I do hope she likes: some earrings, some stamps, some vintage postcards, some vintage buttons, some lovely material from the 1920s for crafting, and my favourite thing: a 1949 Atlas full of lovely colour maps and some pretty great black-and-white photos. ...And it was full of lots of goodies! Gypsy the Cat was pretty interested in my little haul! It is full of lovely gloves, scarves and hats to knit! How fun! Thanks so much to Danni for organising, and to Kelly for being a great swap partner. I am a big fan of a lovely package!!! Thanks ladies! 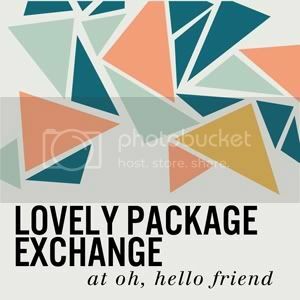 And if people are interested, another blogger I follow, Rin from Papered Thoughts has also blogged about her Lovely Package Exchange experience. Check it out! Oh, there is so much fun to be had in the blogosphere - and I am even more excited when the blogosphere merges with actual reality in my mailbox!! I'm so glad you liked the package Helen, I absolutely loved mine!! What a great idea. Getting parcels in the post with interesting and delightful contents is one good way to give life that little buzz of happiness.